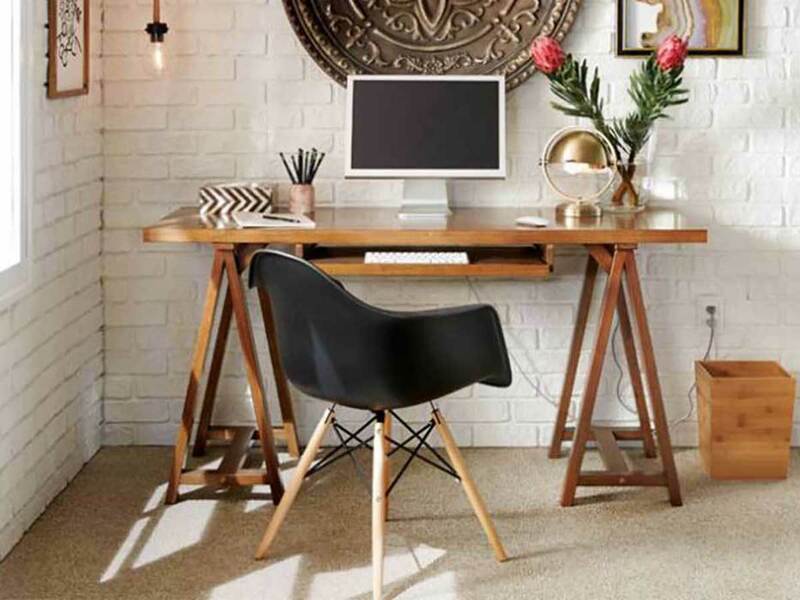 Create an inspiring work spot by updating the desk with a new theme. We know it’s a bit funny to talk about deco trends for everyone, so take our trend report. The creative work spot. Use natural textures and neutral tones as a base for an arts and crafts feel. Here we used a desk and chair in pale wood that stands out against the black chalk wall. Inject some energy with a couple of bold brights. A colorful rug with a zigzag pattern completes the look. Choose a neutral color like white for bigger pieces of furniture and add a bold monochrome rug to mark the space (this one has a soil-resistant wool surface). A few powdery pastels will soften the look – with shades of pink and light wood. The space-themed work spot. Inspired by space trends, dark blue tones can be used to contrast the universe with crisp white. To improve the appearance, the small star shapes on the wall are painted and a few planets are added. Colour palette. Choose your colours with care when decorating your work space. Colours such as blue and green help improve focus and efficiency whereas yellow inspires optimism. Try to avoid too much red or orange as these can be too intense and distracting. For a simple way to add some colour, update your desk accessories with bold coloured lamps or storage boxes to bring some sunshine to your working space. The more your work space represents you, the more comfortable you will be.